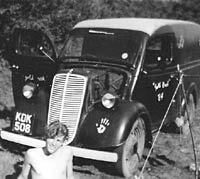 Ford Thames & Fordson 10cwt vans (E83W type). Homepage. This page: Collection of photographs of a van used on a trip to pan for gold, and other examples. Ford E83W Photos - Page 2. 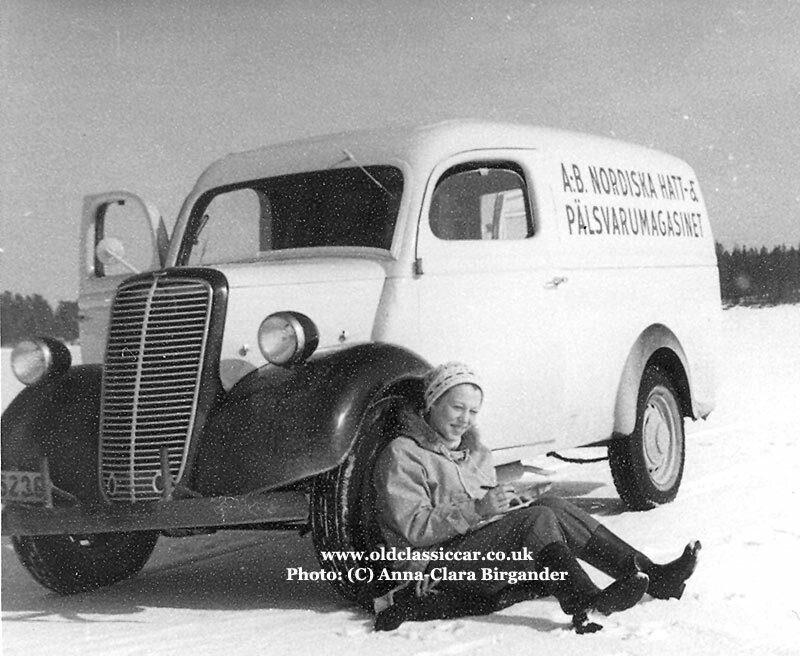 "It is truely said that your first car is your favourite, and so it is with me and my Ford Van. 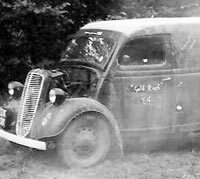 I have had many, many cars in my time - from 1935 Austin Nippy to Mark II Jag, from TR3A to 1929 M type MG, VW Campers to sliding-door-Bedford van et al, but my very favourite was the Thames 10cwt." "Three of us went up to Pimpsaint in Wales to where the old gold mine from Roman times was still open and we went down it, no outside help, no health and safety etc, just there for anyone to enjoy. We did do some panning from the old spoil tip and came away with about enough to pay for the petrol and that's all. But it was a most enjoyable holiday-with-a-purpose, and one we have looked back on with many pleasant memories ever since. 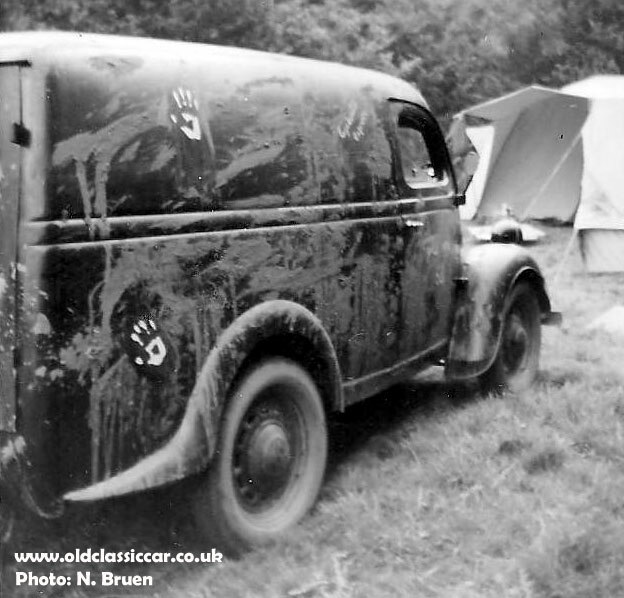 The decoration on the van is of my sister's feet and hands in paint, the sort of decoration that was quite "avant-garde" in the early sixties. Anyway, it was a wonderful van even if it had to be constantly topped up with oil and water. In fact I used to carry 20gals water and 10gals oil in the back, in old fertilizer cans. The oil I used to get from the local garage, discarded from oil changes of more prosperous cars. Seems a cavalier way to treat a motor but we were young and learning and we got better quickly. How I would love to have such a van again. I would certainly treat it a lot better." 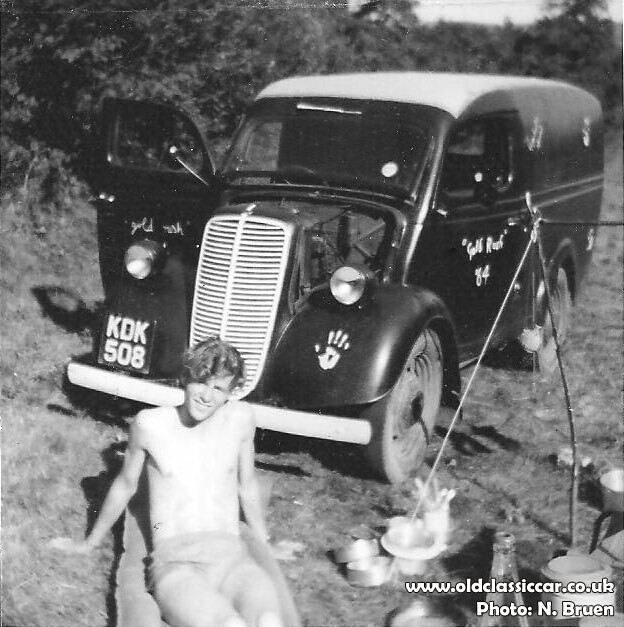 The first photo shows the Thames van, KDK 508 (registered Rochdale, 1953) at the campsite, windscreen open, with its bonnet removed no doubt to aid engine cooling. 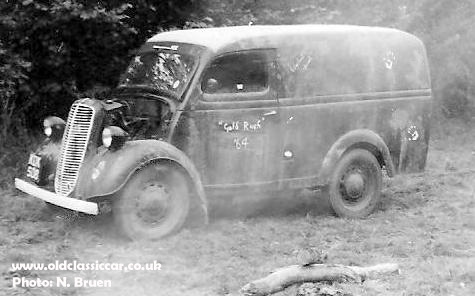 There then follows a low-down shot of the van from the offside rear corner, its wheels spinning as it negotiates the field. All good fun, the van would get a lot muddier before this gold trip was over. 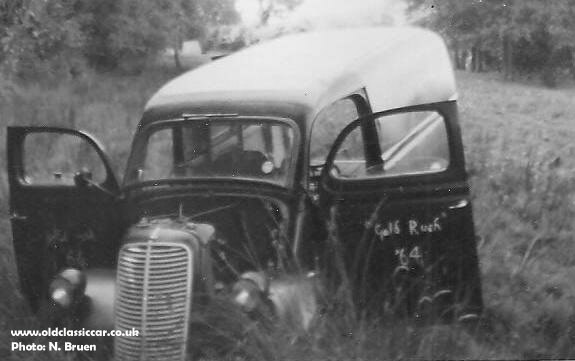 Next, a photo of the old Ford nose-down in a ditch (note the screen still open). Evidently it would require towing out. Fortunately a local farmer was willing to help pull the stricken van out of its resting place, using a trusty grey Fergie. Another look at the mud-splattered van, with its bonnet removed once more to help cool the mighty 1172cc powerplant. These sidevalve Fords are quite prone to fuel vaporisation too, so again radical cooling methods are often required. 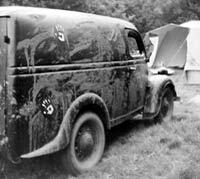 In later years the van, according to Nigel, began to suffer in the corrosion department. 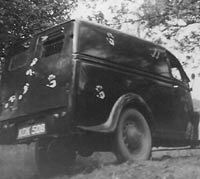 A radical idea was hatched to convert the tired van into a special, nicknamed the "Lost Cause Special". It was inspired by a one-off built by a Fred Smyth of Belfast, which featured in P.J. Stephens' book titled Ford Specials, published in 1960. With this in mind, the van was partially stripped and work began on its conversion. 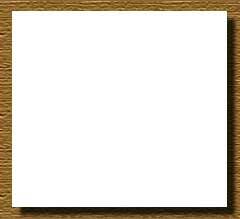 The colour photograph below shows it after some progress had been made. 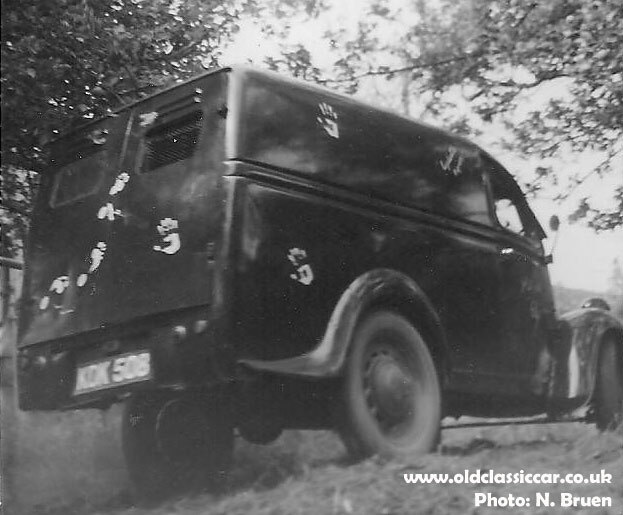 However, life and other vehicles got in the way and the project wouldn't be completed, and the van faded away, surviving only in these fascinating old photographs of several decades ago. My thanks to Nigel for sending these over. 2. 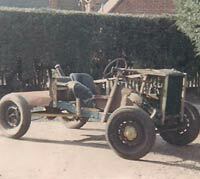 An earlier, Fordson, variant. "My main "preservation interest" is the vast range of products made by Turner Manufacturing of Wolverhampton, but whilst talking to a guy who has some Turner stuff on ebay, the Ford engine reminded me of a couple of things. 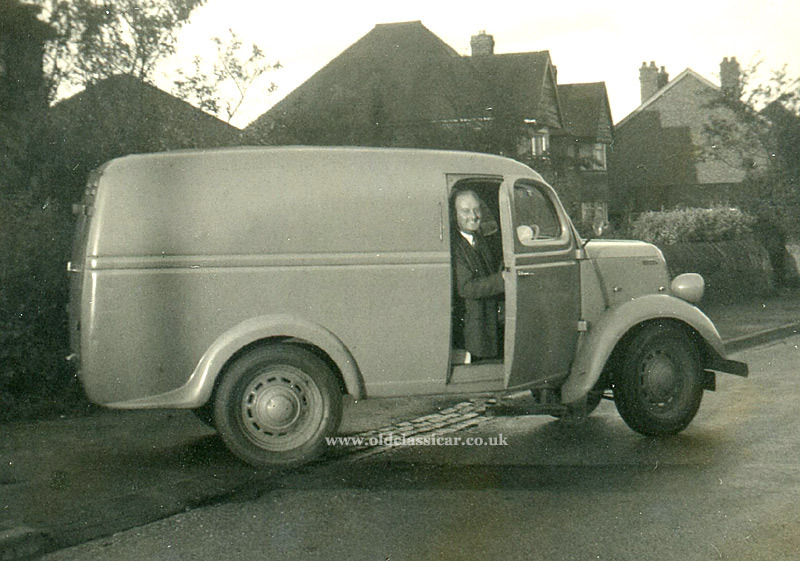 I have a couple of photos (attached) of the E83W van used by one of Turners dealers in Lincolnshire, C.C. 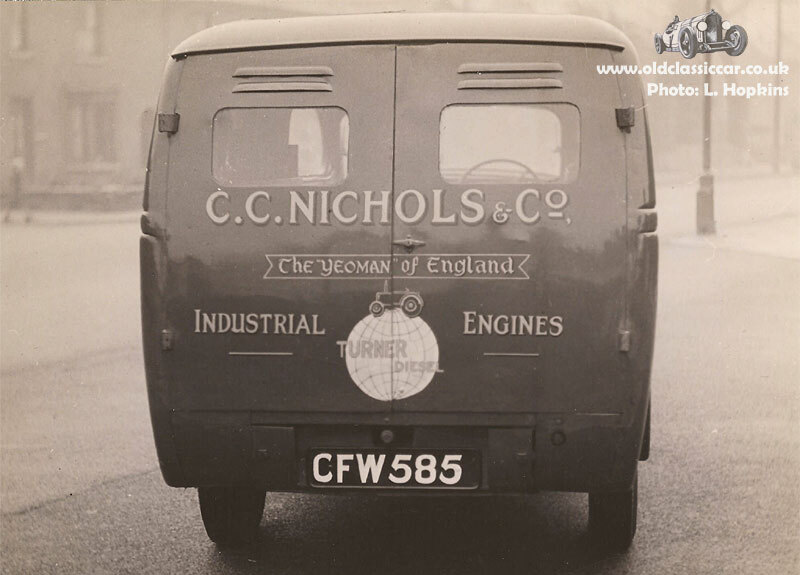 Nichols Ltd. Don Everalls, the Ford dealership in Wolverhampton which sold the whole range of Ford cars, trucks and coaches also sold the Turner tractors and engines. Just one of the many "mad little thoughts" I get - is there anyone out there with an E83W who would consider painting it up as a Turner dealers van? Perhaps it could be adapted to show Everalls as Ford dealers on the one side, and Turner dealers on the other? "To mark 50 years of 6X tractor production at Basildon, there are plans for a major exhibition at the Newark show Ground in June 2014. Ford commercial vehicles will be welcome. I do hope that there will be at least one E83W there. It would be amazing if it could be in Turner dealer's livery. 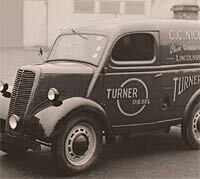 Turners went on to be a major supplier to Ford Tractor. I have an idea for a display of the gears that were made by Turners for the 6X engines. To put this alongside an E83W "Turner dealer's van" would make an excellent exhibit. 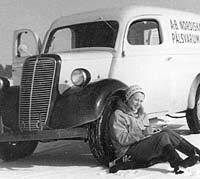 I believe the van was typical of those used by the dealer network for the Turner diesel engines produced from 1946 to 1956. 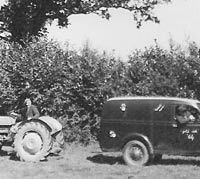 The four stroke V95 series was available in single, V-twin and V4 configurations, with the best known application being the "Yeoman of England" farm tractor. 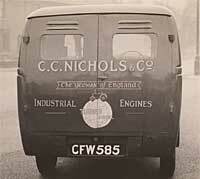 The first of Larry's photographs captures the great signwriting that has been applied to this Fordson van, CFW 585. This Lincolnshire registration first came into being in February 1945, so presumably this E83W also dates to 1945/1946. New vehicles were not widely available at the time, so C.C. Nichols & Co. Ltd. would have had to demonstrate their essential needs for such a vehicle, before gaining permission to purchase. 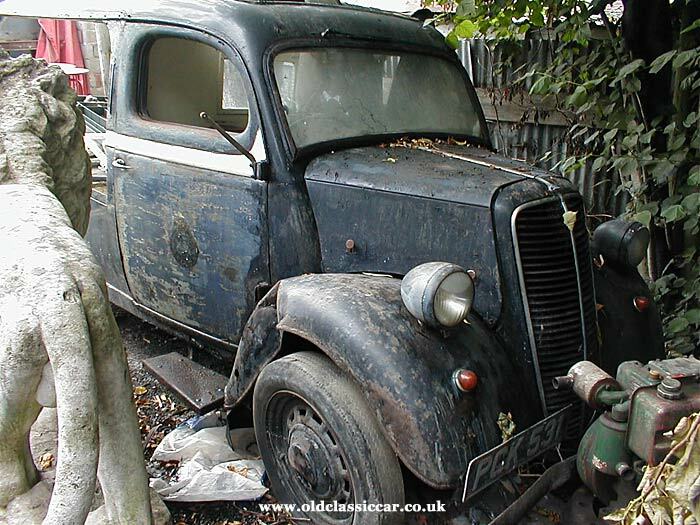 Identifying features that confirm that this is an early Fordson van, rather than later Thames, include the non-beaded front wings, the profile of the rear wings, the small headlamps, and the lack of bonnet side badges. There is no stainless trim fitted to the radiator grille - possibly a wartime feature, rather than simply missing, although the grille looks slightly out of shape to me. What a cracking photo. Photograph number two in this pair is a rear view of the 10cwt van. Note the hand-painted registration plates, something that always looks good on a vehicle of this age. Illumination requirements didn't play a big part in Ford's thinking in those days. Rear turn signals were not fitted as standard, the only lamp being the small unit fitted above the number plate. A young lad in shorts can just be made out walking in the background, to the left of shot, someone who will remain forever unidentified - perhaps even a wartime evacuee. 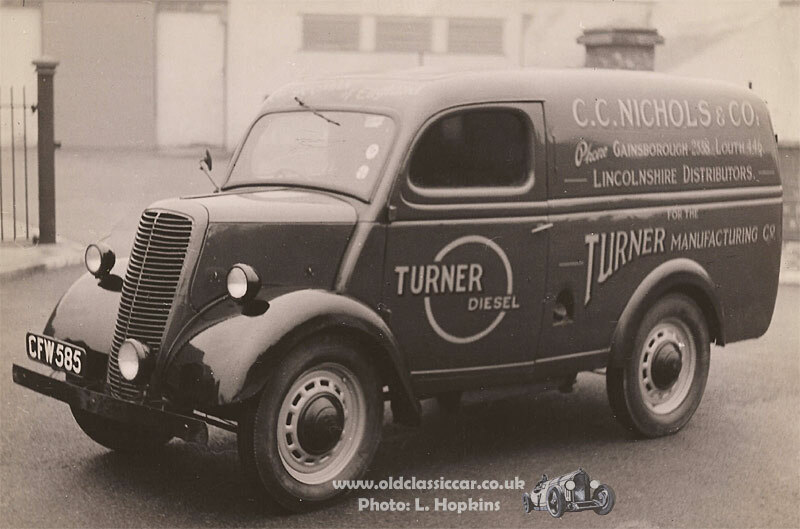 Thanks for sending the photos over Larry, if anyone has more details and/or photos of vans used to distribute Turner industrial engines in this period, please get in touch as both Larry and I would be interested to hear more. Further period photos of E83Ws are also welcome! 3. A van in London. 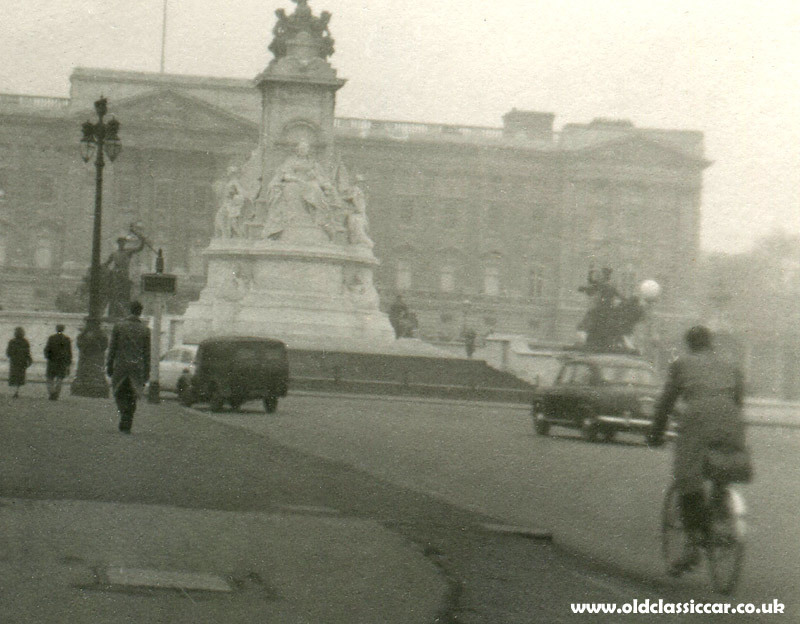 'Twas a chilly murky day, on 1st February 1958, when the first owner of this photo raised their camera in the direction of Buckingham Palace and pressed the shutter button. 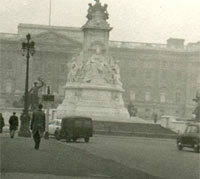 Pedestrians make their way towards the Palace, while the owner of an anonymous Ford 10 van pauses momentarily, facing the Victoria Memorial. The traffic is comparatively light, so faster vehicles will have little difficulty in overtaking the modestly-powered Ford, should the need arise. Production of the E83W series had drawn to a close the previous year, 1957. 4. A trip to a frozen lake. The following three photos were kindly sent over by Jan-Erik Bothen in Sweden. 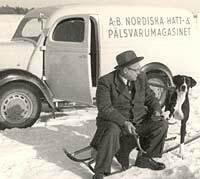 They portray his friend - Anna-Clara Birgander - and her father, on a fishing trip to a frozen lake in Sweden, during the 1950s. The location is Lake Vaenern close to Karlstad, which is a mid-size town in middle of Sweden. 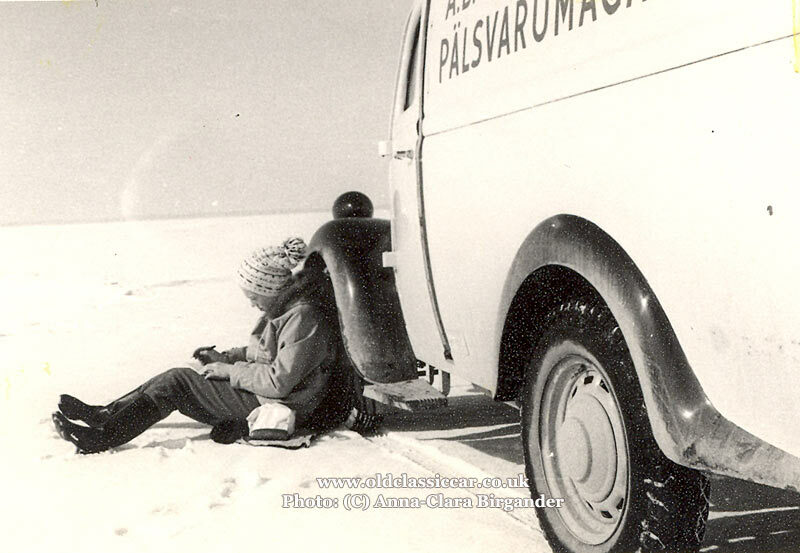 The first photo shows Anna-Clara sat leaning against the E83W van's front wheel, on the frozen lake. Other than two small brackets fitted to the front bumper irons, the van looks to be mostly in original specification. 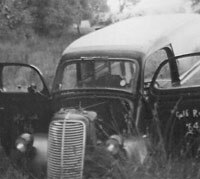 Judging by the single windscreen wiper, the van was left-hand drive (common in Sweden at the time), yet there's only one rear-view mirror fitted, on the opposite side. In the 1950s, Swedish vehicles drove on the left side of the road (as in the UK) until September 3rd 1967, when the switch to driving on the right was made. An interesting write-up of the switch may be found on this external link. Another shot of the same scene now. One deviation from standard can be seen here. Vans typically were supplied new with 18" diameter wheels, this van though has the wider-section 16" rims, more usually found on the pickup variant. 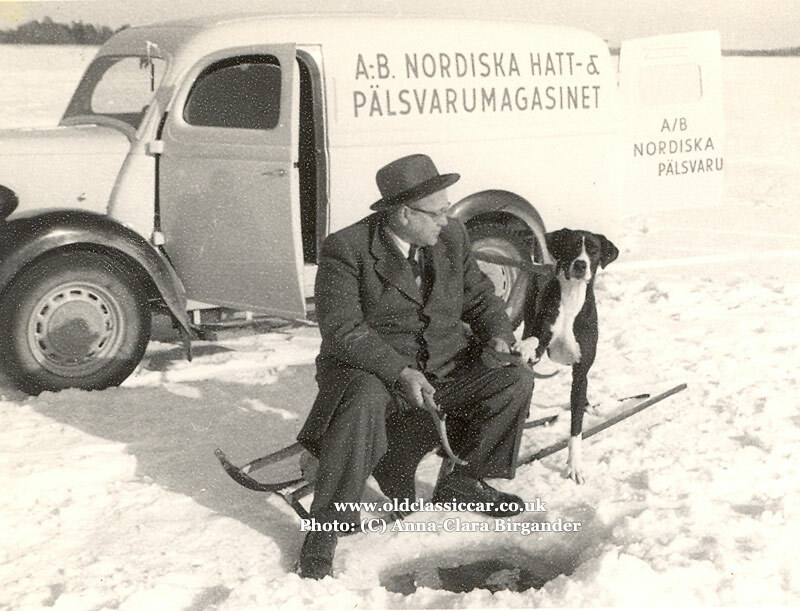 The final photo in this trio show Anna-Clara's father (Carl Birger) fishing, accompanied by their Great Dane named Glenda. The LHD steering wheel can just be seen inside the cab. Unusually, the centre roof panel - which is usually a black Rexine fitting - appears to be body coloured in these photographs. Thanks for sending the photos over, and for permitting me to share them at OCC. 5. 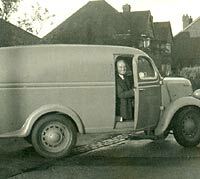 A 1956 Thames E83W milk float. 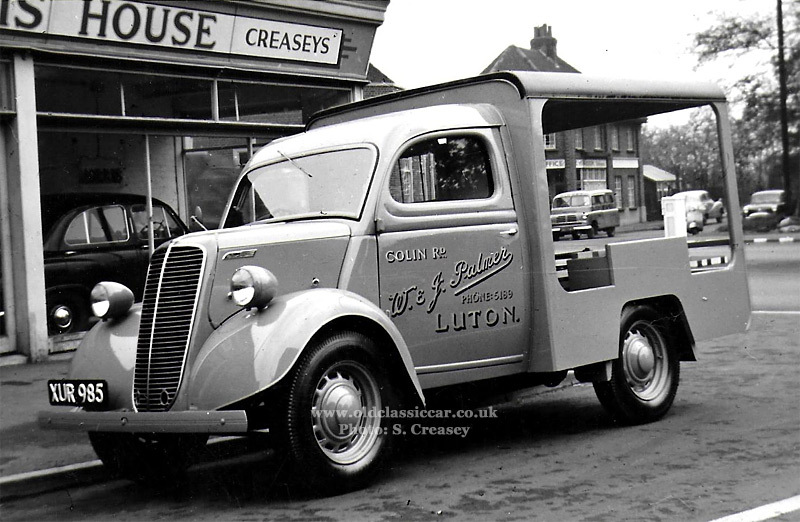 Creasey's ran garages and a very successful coachbuilding company in Knebworth, Hertfordshire, throughout the 20th Century. Stephen Creasey has a fascinating archive of old photographs taken during the company's life, and it's with his permission that I've shared a few on OCC. 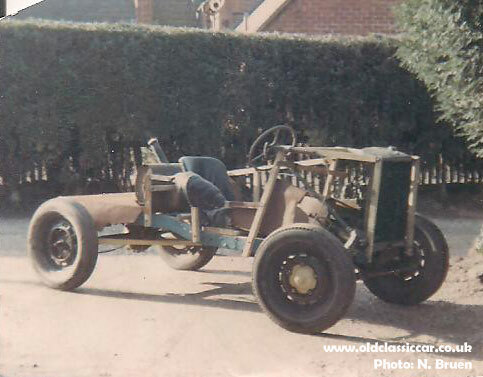 For the E83W Ford page we have this superb photo of a newly-bodied 10cwt milk float, the original vehicle being supplied as a rolling chassis, front end and cab, to which the bespoke milk float body was built on. The polished tyres point to this being a photo of the float just after completion, parked outside one of the family's garage premises (a Morris agency, judging by the sign and car in the showroom). 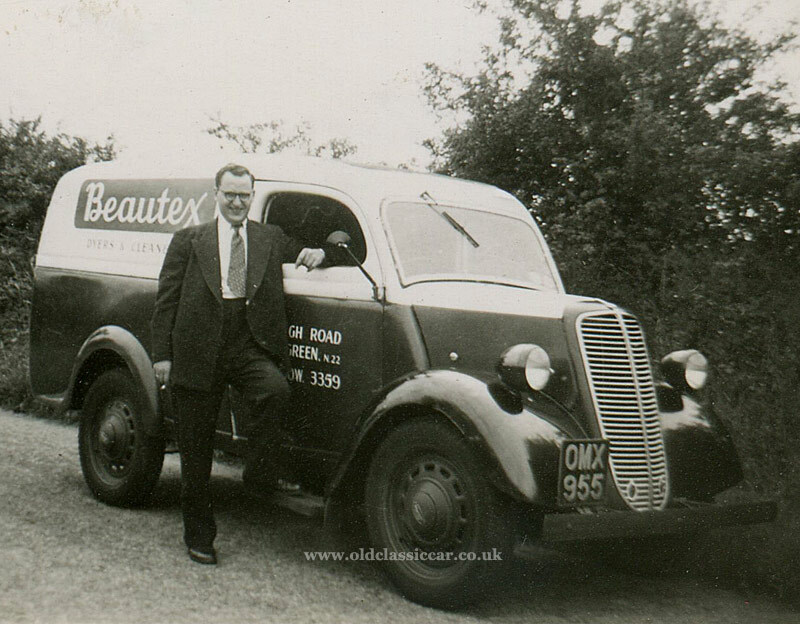 The Ford was registered XUR 985 (in 1956), and finished in the livery of W & J Palmer, of Colin Road in Luton. Wide-section 16" rims more usually found on the pickup version are fitted in this instance, all it needs are a few crates now to put in the back! Other automotive gems visible in this great shot are a Bedford CA Mk1, a scooter, an Austin A40/A70, and a Standard 10. 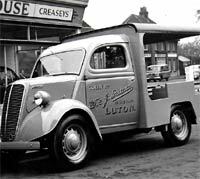 A milk float E83W spotted some years ago. Having an interest in these half-ton Fords for many years, I've been fortunate enough to stumble across a few in my travels. One, spotted in Macclesfield circa 20 years ago, was a milk float based around a standard van that had been cut open and modified. Whether it was ever restored - or even survives now - I don't know. The nearside door was loose in the back, perhaps it had been removed while "in service" to permit the milkman to enter and exit the driving compartment more speedily during his rounds? The rear body was slightly out of "true", but it certainly looked restorable back then. 6. A Thames E83W preparing to tow a caravan. Being kind, the performance of an unloaded E83W van, with its 1172cc engine and low rear axle gearing, is best described as "leisurely". 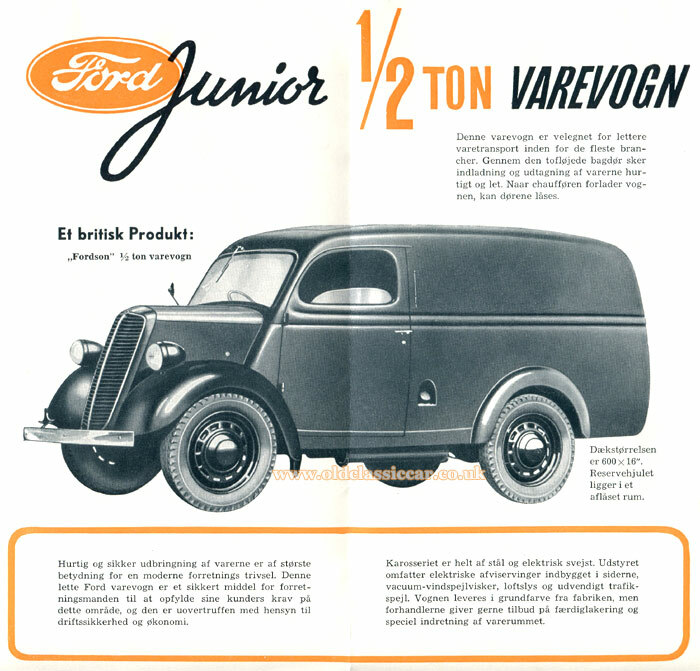 It was designed for local deliveries of loads up to 1/2 ton in weight, and in this role it performed well, and proved very popular with buyers throughout the nineteen years that passed between its launch in 1938, and demise from the catalogues in 1957. Henry kindly sent over the following photograph of an E83W readied to tow a caravan. The outfit belonged to Gray's, a dealer in agricultural equipment in Scotland, and the photo was taken prior to heading off to a local show at which they'd market their wares. The performance of the combination, with the van no doubt loaded with sales publications and quite possibly items of equipment, must have been decidedly tardy. Road speeds were lower in the 1950s though, and fewer drivers seemed to be in a rush than those out on the roads today, so I doubt it caused too many problems for other motorists. The rear chassis of an E83W isn't ideally set up for accommodating a tow-bar as there are no sturdy crossmembers at the back, so a little ingenuity would have been required. 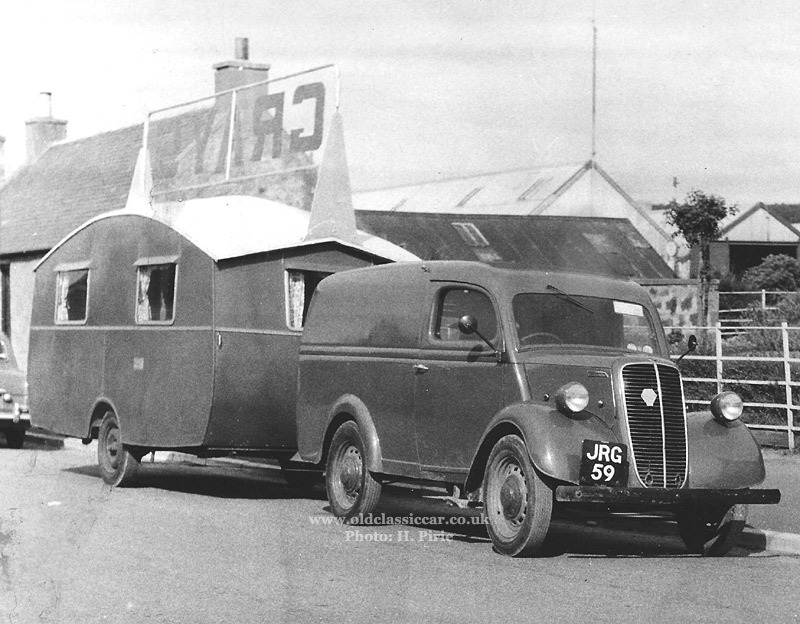 JRG 59 is a (late) 1955 van, registered in Aberdeen which is where the company's owners were based. Note the AA badge fitted to the grille, an all-silver badge specifically for operators of commercial vehicles. 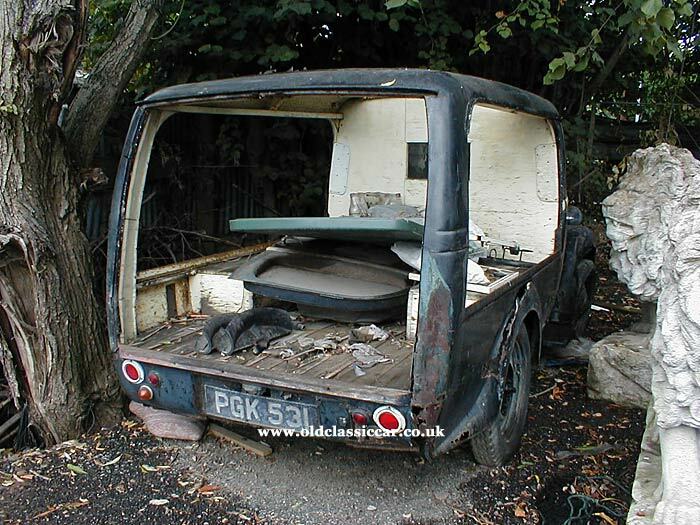 As for the caravan - maybe an Eccles? Thanks for sending the photo over Henry! 7. A London-registered Fordson 10cwt van. Unusually, whoever first owned this photograph reached for their ink pen and added a few notes to the reverse side of the print. 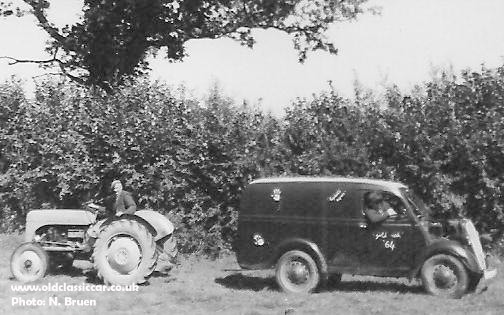 Ford 10cwt van registration OMX 955 is shown here parked in a quiet Norfolk lane, on August Bank Holiday in 1951. This tallies with the OMX (London) registration series, that was first used in 1949. 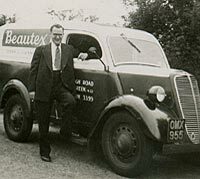 The van is in the livery of Beautex Dyers & Cleaners. Oh for a colour version of this photograph! With the front wings finished in their original black I assume, the remainder of this Fordson E83W's body is in two-tone. Note the hubcaps with the "Ford" script on them, not something seen on vans or pickups all that often in period. Who the chap was, captured on film enjoying a swift Park Drive or Woodbine perhaps, is anyone's guess. Norfolk, with its distinct lack of mountainous terrain, would have been ideal territory for a ride out in an E83W, given its leisurely performance abilities. 8. 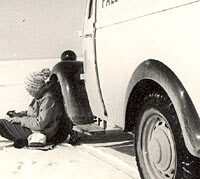 Side view of a panel van and its driver. A cheerful E83W van driver is shown sat at the wheel of his trusty light-coloured Thames in this next photo. Alas its registration isn't visible, so its identification will forever remain a mystery. Once a very common sight on Britain's roads, E83Ws are few and far between nowadays. Period brochure for the Fordson E83W. After publishing the photos of the van in Sweden, I had a look to see if I had a period brochure for either a Swedish Fordson or Thames E83W (see photo entry no.4 above), however I did find one in a box for neighbouring Denmark. The date code for this publication is March 1949. Inside, is an illustration of an earlier variant. Note the pre-war domed headlamp lenses, and the different profile of the rear wheel arch when compared to that shown above. The front bumper is shown with a plated finish, although I'm not sure they were ever sold with anything other than a painted bumper bar. Visit page 17 in the vintage gallery, or return to the gallery's main index page. 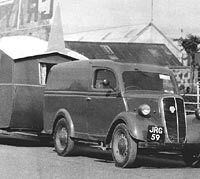 Amongst other things, you'll find two fascinating photos of an E83W that was converted into an articulated transporter, and used to deliver Bond Minicars in the 1950s (link).